This website will present an integral view of the Unimak Island area of Alaska with a focus on history. A broad sweep of cultural and physical environmental information will be presented to put the area in its proper ecological context. Unimak Island is the first island in the 1,400 mile long Aleutian Island Chain in Alaska. Culturally and environmentally, the Unimak Area also includes the lower Alaska Peninsula and the Sanak Islands. The Aleutian Islands are the ancestral home of the Native American Aleut people, who called themselves "Unangan". 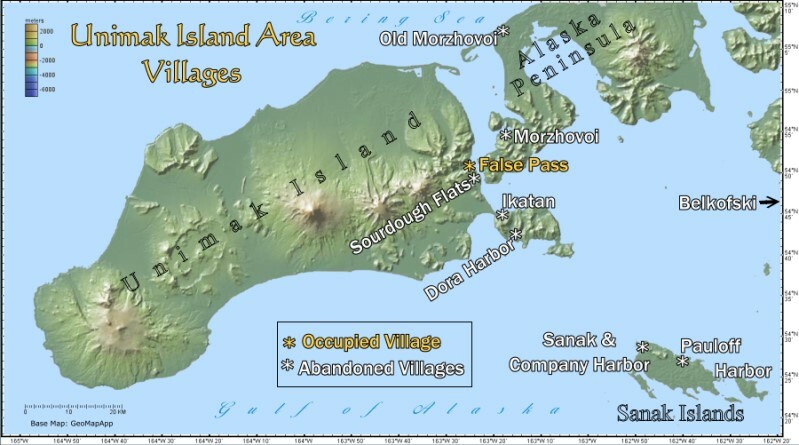 The Unangan have occupied the entire Aleutian Island chain, including Unimak Island and the lower Alaska Peninsula, for thousands of years. The Aleutian area is a very productive marine environment that has provided the Unangan with a very stable and prosperous standard of living. In the mid 18th century, the stable life that was long enjoyed by the Aleuts was abruptly interrupted by the invasion of the Russians who were seeking profits from the sea otter fur trade. The introduction of European culture, diseases and technology has had a profound affect on Aleut society. It also resulted in a disasterous decline in Aleut population. This website will present some of the history of the Aleuts in the Unimak area and document what has happened to their numbers over time and where they stand today. Since the U.S. purchased Alaska in 1867, the Unimak area has been experiencing an accelerated rate of change. Aleuts are now integrated into the modern global economy. The primary economic activity in the region is commercial fishing for salmon, halibut, crab and cod. Below is a sketch made in the Unimak area in 1872 by H.W. Elliott. 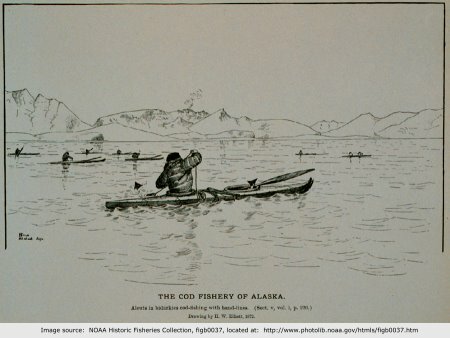 It shows Aleuts fishing for cod from baidarkas (kayaks). Click on image for larger version of drawing. 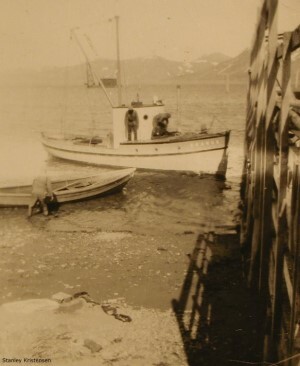 The F/V Uranus comes up to the Kristensen dock in False Pass, Alaska in the 1930's. The Uranus is a classic wooden fishing boat of its day with high bow and tumblehome stern, making her very seaworthy. The wheelhouse is small and there is a large fo'c'sle for the crew quarters. Beach seining was the main commercial salmon fishing method in those days. Dories were the skiffs used as they were sea-worthy and could be rowed. In the background can be seen the P.E. Harris cannery pile driver, perhaps returning from working on the salmon traps in Ikatan Bay. Snow in the ravines on the distant Alaska Peninsula indicates that the picture was taken in May when everyone was preparing for the salmon season starting about June 1st. Click on village name to be taken to the page for that village. Content on this website is protected under Creative Commons. Click on logo for details.